Photos above by Hubert Neal Jr.
A frequently heard comment in the wake of the May 23rd assault by Jamaican security forces on Tivoli Gardens is that Jamaica Defence Force soldiers are far more civil and easy to trust than the police. The latter stand accused of shooting to kill without any consideration for whether the target is actually a suspected criminal or not. The soldiers on the other hand have been accused at the most of paying too much attention to the young women of Tivoli, an area that has remained under curfew ever since the barricades of Tivoli were demolished. Of course the soldiers too are alleged to have participated in some questionable activities such as the hasty and unauthorized burial of bodies in makeshift coffins during the siege of Tivoli. But their reputation has fared far better than that of the much reviled and feared Police Force accused of wantonly killing young men in the affected areas. According to a Trini friend who generally knows about such things, a state of emergency is an opportunity for rogue police to go around eliminating those who are their partners in crime in times of peace–those who abet them in drug dealing, illegal taxi operations, extortion among other things. If true, this could explain the outrageously high number of casualties in the operation to capture Dudus–who of course, remains free and alive. The Hunt for Dudus has inspired Belizean artist Hubert Neal Jr., who arrived in the island on May 20, just before the ‘Operation Take Dudus Alive’ unfurled. 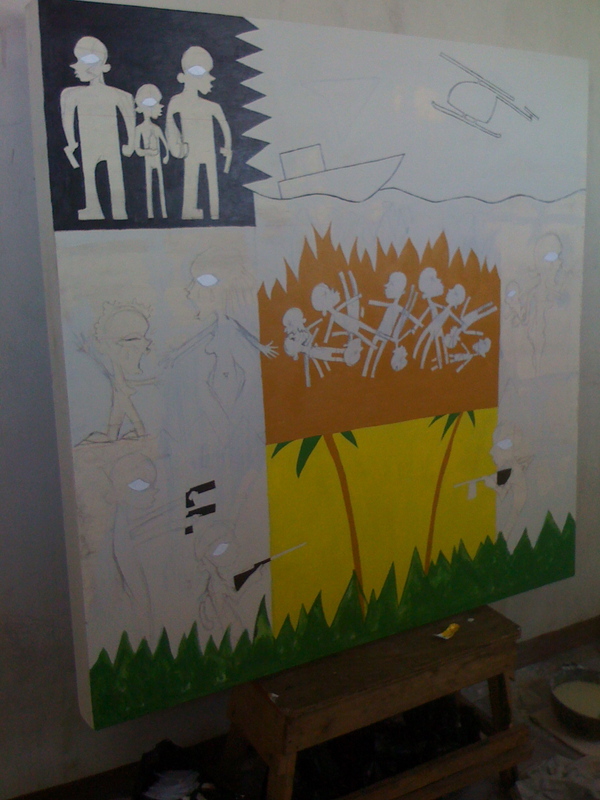 Neal, an artist in residence at Roktowa on Pechon Street around the corner from Coronation Market and Tivoli Gardens found himself the recipient of an unlikely studio visit a few days ago when three groups of soldiers decided to patrol the old Red Stripe Brewery where he works along with the Haitian artists who are part of the ‘Trembling Heart’ project. 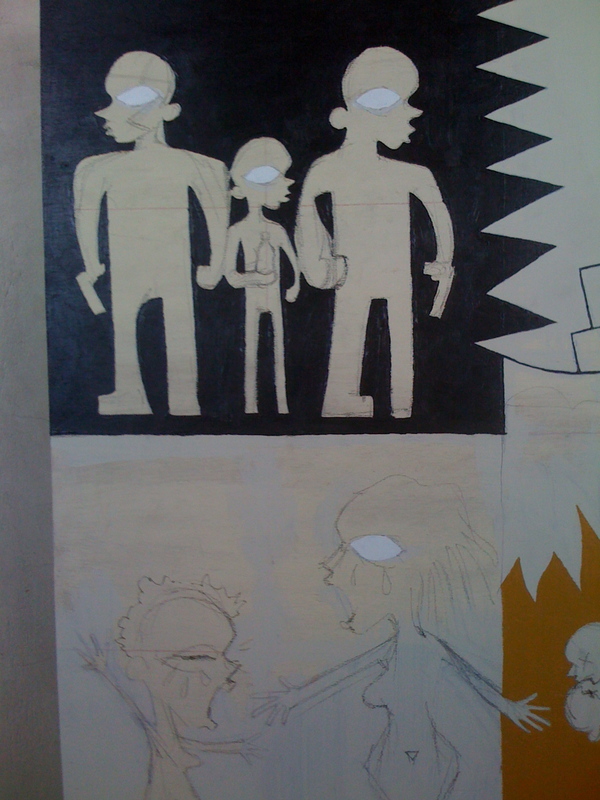 The soldiers allowed themselves to be detained by Neal’s painting in progress, titled–what else–The Hunt for Dudus. They questioned him closely about his representation of the storming of Tivoli, disapproving of the low number of soldiers depicted (see photos above and below). On the whole however they were quite animated by the work they saw and their unorthodox art critique thrilled Hubert who documented The Studio Visit on his blog The Visual Poets Society. The most potent paintings i think are the two below, Hubert’s depictions of the torture chamber the media described finding in Tivoli. I’m particularly moved by his interpretation of the grave found with a skeleton buried upright in it (below right). 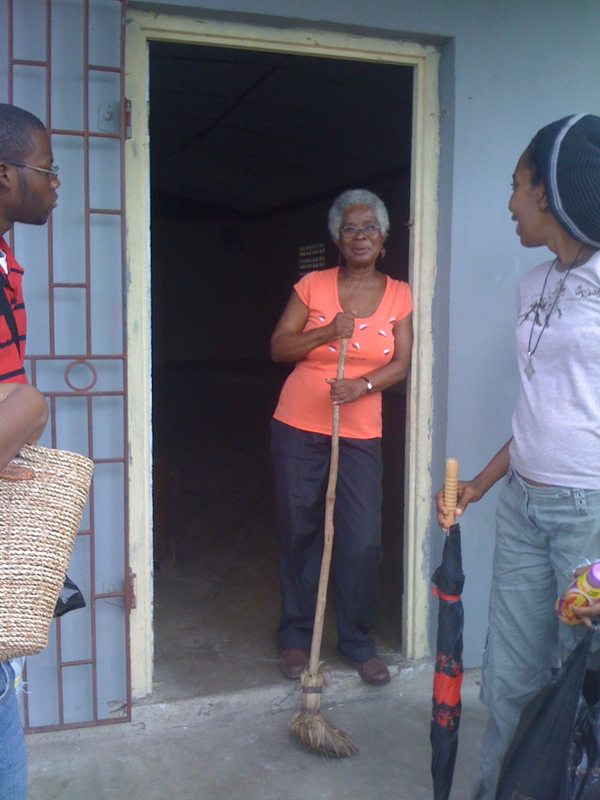 Last Saturday we were part of a visit to award-winning writer/sociologist Erna Brodber‘s home at Woodside, St. Mary. As part of her Blackspace project she has documented various sites and relics dating from the days of slavery. One of the things she mentioned was the existence of what she referred to as a ‘punishment hole’ somewhere in the vicinity. What’s that, I asked. Well, sometimes slaves were punished by being buried upright up to their necks for days on end, said Erna. Wow, i thought, the Tivoli Punishment Hole was no doubt a variant of this time-honoured method of torture. If you come to Roktowa next Sunday for the opening of Laura Facey’s show Propel you can see Hubert’s painting and work by the Haitian artists as well. In addition to Laura’s marvelous drawings, prints, carving and sculpture there will also be Nine Night singing. The show is curated by Melinda Brown. Click on invite below for address and map to Roktowa. The past is rarely past. 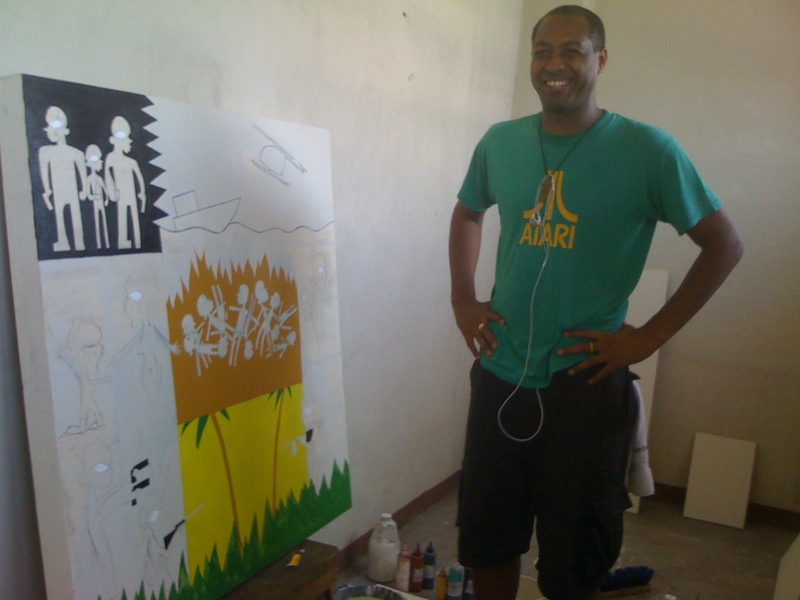 Somehow, it makes sense for Jamaican soldiers to engage in art criticism. I can’t see British, American, or any other soldiers pausing to discuss art. Now getting to see this in full. Great post. Love Hubert’s interpretations of it all. Do you realize there is no one agreed on name for what happened/what was done. You call it “Operation Take Dudus Alive”. I call it “the incursion into Tivoli”. Some call it the Labour Day Massacre. Others call it “the civil unrest/uprising”– neither of which I think are apt. Thanks Diana, i actually did a search coz i thought there was some official name the armed forces had for this attack/search but couldn’t find anything…no it wasn’t a civil uprising.